Un belvédère | One quality, the finest. 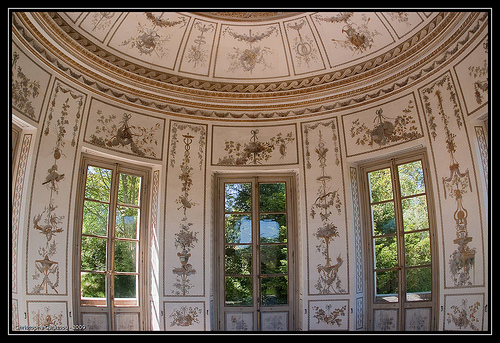 One of the beautiful garden features at Versailles is le Belvédère on the grounds of the Petit Trianon. Un belvédère (uhn bell-vay-dare) refers to any small building that offers a viewpoint. It was built between 1778 and 1781 for Marie-Antoinette as a gift from her husband as an element of the highly desirable English garden style. The original plan had been to create a pagoda since Asian art was all the rage, but this neo-classically inspired octagon won out. 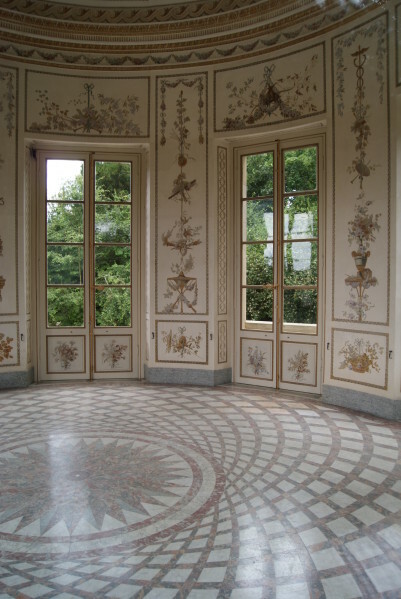 It was described by Austrian Prince Charles-Joseph of Ligne as “the height of perfection, taste, and carving.” The interior decoration was delicately painted with musical and animal motifs and the Queen used it as a music room and for her morning breakfast to watch the rising sun. Sounds idyllic. Over the centuries, the damp environment hastened the decay of the surfaces. Recently, the damage was hastened by water running along the façade and into the foundation (sounds like the disaster that we experience). Moss and lichen flourished on surfaces that had been painted and gilded fit for a queen. Parts of the balustrade around the top were missing. Cracks ran along the walls and the floor. In a site as vast as Versailles, there is simply not enough money to tackle every restoration project. In 2009, the World Monuments Fund in New York undertook the work at the belvédère. The one million dollar project, completed in 2012, tackled the stability of the structure, the restoration of the interiors, and the redesign of the landscaping. They restored the marble floor and repaired the bronze decorative features as well as cleaning and freshening the painted interiors. Do you think they’d serve me breakfast if I showed up nice and early some morning wearing a powdered wig? 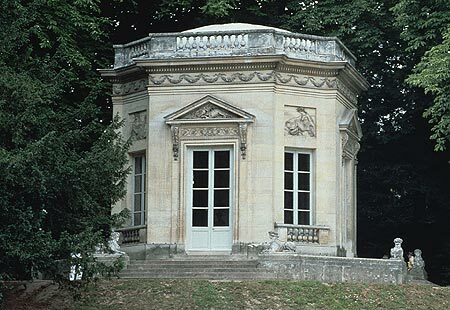 This entry was posted in Architecture, Travel and tagged Belvédère, Marie Antoinette, Palace of Versailles, Petit Trianon, Versailles, World Monuments Fund. Bookmark the permalink. We missed this little building – it is very difficult to see the whole place in one day! I will definitely be going again one day. Thank you for the pingback. It’s no wonder Louis XIV preferred to visit the garden while being carried in a sedan chair. The immensity really has to be seen to be believed. Thanks for choosing to follow the blog. I hope you’ll always find something of interest. merci buckets for the pingback, my dear! Pingback: Remise en neuf | One quality, the finest.